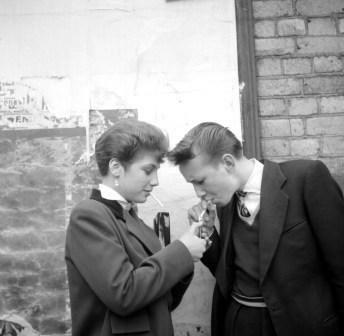 With lady pompadours cropping up everywhere this fall (like the editorial I just previously posted) I have been thinking a lot about the ladies who arguably perfected the hairstyle — The Teddy Girl. 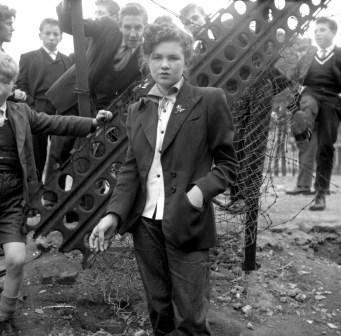 You may already be familiar with the British Teddy Boy subculture in the 1950s and 60s of boys and young men who dressed like the dandies of the Edwardian period, but also had something of a reputation for hooliganism. 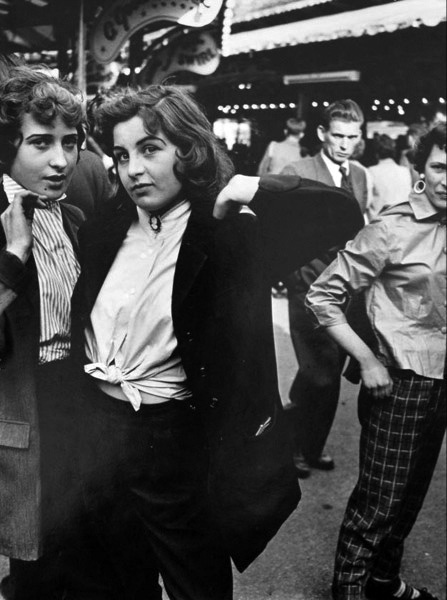 Smaller in number, less well-known and less frequently photographed, Teddy Girls pushed the boundaries of conventional 1950s style for women, with some perfectly emulating the Teddy Boys in both hair style and dress. I love her ribbon/cameo necktie. Love. 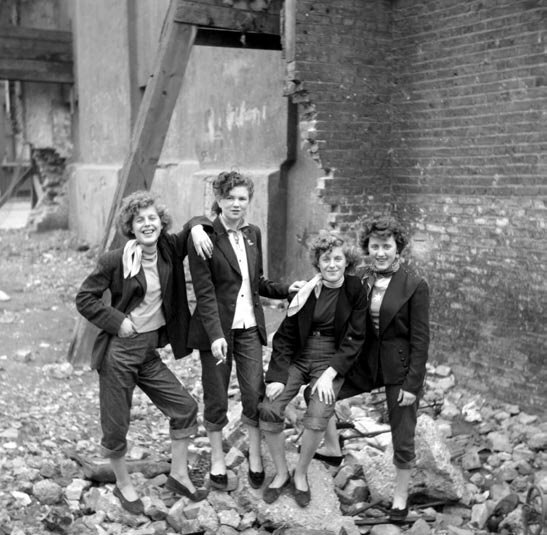 The teddy girls left school at 14 or 15, worked in factories or offices, and spent their free time buying or making their trademark clothes – pencil skirts, rolled-up jeans, flat shoes, tailored jackets with velvet collars, coolie hats and long, elegant clutch bags. It was head-turning, fastidious dressing, taken from the fashion houses of the time, which had launched haute-couture clothing lines recalling the Edwardian era. Soon the fashion had leapt across the class barrier, and young working-class men and women in London picked up the trend. [Photographer Ken] Russell’s work offers a glimpse into the lives of a group of feisty young women who were set on creating an identity of their own. 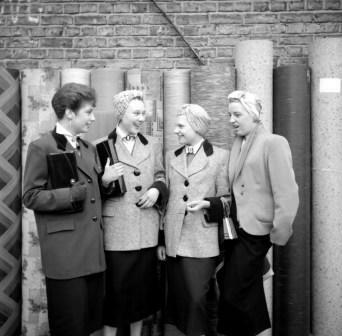 Their choice of clothes wasn’t only for aesthetic effect: these girls were collectively rejecting post-war austerity. Among many people, male “teds” had an intimidating reputation. They were often linked in the public’s mind with violent crime. 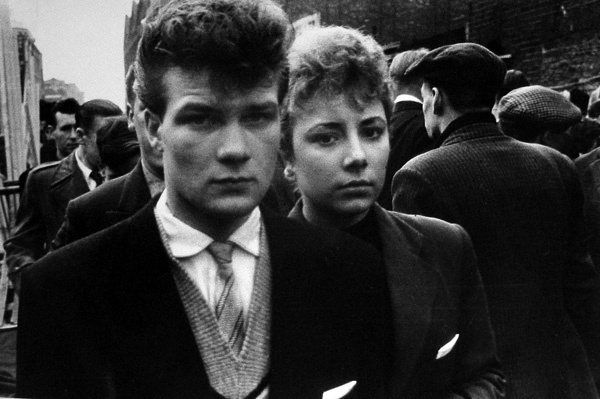 In July 1953, 17-year-old John Beckley was murdered by teddy boys near Clapham Common, and the Daily Mirror’s headline – Flick Knives, Dance Music and Edwardian Suits – made an explicit connection between clothing and criminality. Wow. Amazing. Love the confidence. Oo, had no idea! Love it. 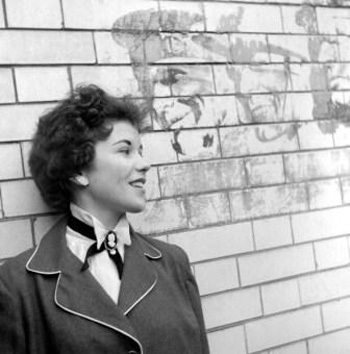 You are currently reading Style Icons: Teddy Girls at Quite Continental.